On October 17th, 2018, an officer from the Lake City Police Department observed a white female standing outside a blue truck which was parked in the lot of an auto auction, arguing with an unknown occupant of the vehicle. The Lake City officer ran the tag on the vehicle and found it had been reported stolen out of Clayton County, earlier that same day. The officer then pulled his patrol car behind the stolen vehicle just as a white male, later identified as David Dewayne Phillips, exited the truck and began to walk away from the scene. The officer ordered Phillips to stop, at which time Phillips proceeded to run from the officer. Phillips approached a nearby vehicle from the passenger side and attempted to hijack it from two occupants inside it. Phillips held a pocket knife to the throat of the victim seated in the front passenger seat, threatening that he knew where the victim lived and would kill them if they did not give up their vehicle. The victim rolled the window of the vehicle up to deter Mr. Phillip’s attack, prompting him to run from their vehicle. This entire exchange occurred in front of the three-year-old child of the two victims. Phillips then jumped into the open driver’s seat of an unattended vehicle with the keys in the ignition. Attached to the vehicle was a two-wheel tow dolly with another vehicle loaded onto it. The Lake City officer was able to reach into the driver’s side window of the vehicle now occupied by Phillips and attempted to prevent him from hijacking the vehicle by grabbing the column shifter. Phillips was able to wrest control of the column shifter from the officer and get the vehicle into gear. Phillips proceeded to drive away from the incident location, dragging the officer, who was partially inside the vehicle, along with him. The officer was spun around and his right leg was struck by an unknown object. Upon attempting to run back to his patrol vehicle, the officer felt a sharp pain in his leg, and was forced to limp back to his vehicle. The officer then initiated a pursuit of the stolen vehicles operated by Phillips, who had struck multiple vehicles as he fled the scene. During the pursuit, Phillips drove erratically, running a stop sign and a stop light, forcing other drivers in the path of the pursuit to use evasive maneuvers in order to avoid a collision. At one point in the pursuit, Phillips momentarily lost control of the vehicle, causing the towed vehicle to swing wildly, striking a street sign. This loosened the straps tethering the towed vehicle to the tow dolly, which resulted in the towed vehicle becoming separated from the vehicle operated by Phillips striking the street curb causing substantial front-end damage. Units from the DeKalb County Police Department took up pursuit of the stolen vehicle along with Lake City Police Department. Phillips then, once again, lost control of the stolen vehicle, colliding with two other bystander vehicles, at which point the suspect abandoned the now-disabled stolen vehicle and fled into the back yard of a nearby residence. Officers were able to take Phillips into custody, but not before being forced to use a taser in order to subdue the suspect. Phillips was transported to the hospital for injuries sustained during the pursuit, and was released by medical staff causing him to escape custody. 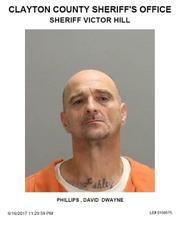 The Lake City Police Department subsequently issued warrants for David Dewayne Phillips’ arrest, in direct relation to the above incident. Phillips is to be considered armed and dangerous and if spotted, 911 should be dialed immediately. If you have any information to Phillips whereabouts, please contact Sheriff Victor Hill’s elite Fugitive Squad at 770-477-4479.